Photo credit: Sam Beebe on Flickr. average discharge 19 m3 / sec. Chilko Lake is one of the largest lakes in the province of British Columbia, Canada, especially because of its great depth. Its main outflow, the Chilko River contains the longest white-water rapids in North America, which can be commercially navigable. The lake is fed by dozens of mountain creeks and is located in a rugged and relatively untouched wilderness region, covered in tall mountain ranges, stunning waterfalls, eternal glaciers and green pine forests. The 180 km2 lake is located on the Chilcotin Plateau, and the glacial valley on which it can be found opens onto a large lava plateau, which lies inland from the highest section of the main mountain range nearby. The peaks bordering Chilko Lake are among the tallest in British Columbia. Moount Good Hope, with an elevation of 3243 m and Mount Queen Bess, with an altitude of 3242 meters are two of the most important peaks close to the lake. 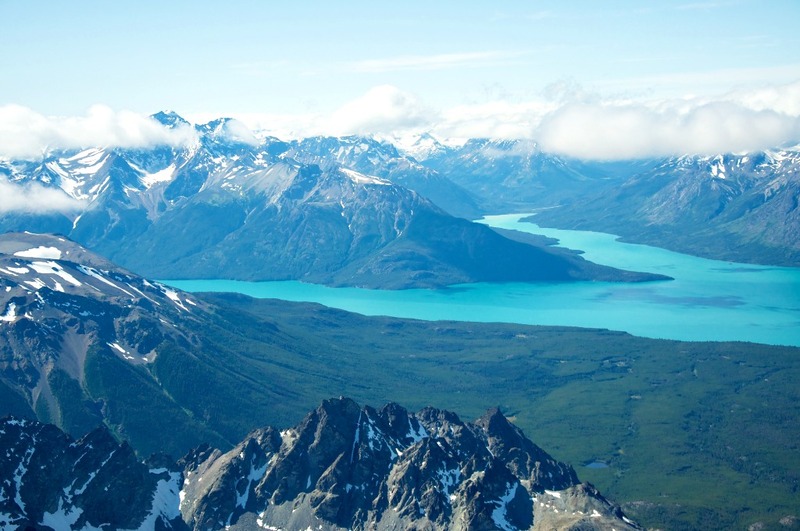 The area between the Chilko and the Taseko Lake basins is a protected area, called the Ts’ilos Provincial Park. It is co-administered by the Parks Branch of the provincial government and the Xeni Gwet’in, made up of residents of the Nemaia Valley and the Tsilhqot’in people. The Provincial Park is mostly covered in Douglas fir forests on lower elevations and dry alpine vegetation on higher grounds. Grizzly bears, wolverines, bald eagles and mountain cats make up the most frequently-seen animals of the park. There are, however, a few ecologically sensitive species such as the California bighorn sheep. The area surrounding the lake served as the backwoods maneuvering site for the Chilcotin war of 1864. The Xeni Gwet’in people are said to have descendants of the Klatassin, who initiated the war, still living in the lake basin. In the 1950s there were discussions about the Chilko River and Lake as a potential hydropower resource for Alcan. But because of the large salmon presence, the plans were passed over. The hydroelectric plans included the diversion of the Taseko Lake into Chilko Lake. They also had in plan to combine the Chilko and Taseko Rivers, which flow into Tatlayoko Lake via a series of dams down the Homathko River. Since the area between the Tatlayoko and Chilko lake’s isn’t officially protected, so the plans for these dams could still be made possible. The largest one was to be built immediately atop the site of the first battle of the Chilcotin War, marked as “Murderer’s Bar” on government maps. In the vicinity of the lake, especially in the Brittany Triangle area, between the Chilko and Taseko Rivers, one of the last holdouts of the Cholcotin Country’s once numerous herds of wild roses can be found. The area is in discussion of becoming a reservation site. The most popular activity is fishing, with steelheads, cohos, Chinooks and sockeye salmon representing the most important catches. The salmon actually travel 500 miles to reach the lake. In autumn they begin their spawning, and it’s the perfect time to spot bald eagles, ospreys, blue herons, ravens, seagulls, coyotes, lynxes, black bears and especially grizzly bears feasting on them. It is one of the best locations in Canada to spot grizzlies. It is also a prime spot for hiking, mountain biking, kayaking, and wildlife viewing. Chilko Lake lodge supports numerous water sports activities, such as rafting on Chilko River, kayaking and canoeing on the lake. Bear Camp is known for glamping, which is a more luxurious side to camping in upscale waterfront safari-style tents.